Microsoft Ignite 2018. FourVision will be there. Will you? FourVision will be attending the annual tech event held by Microsoft from the 24th-28th of September. 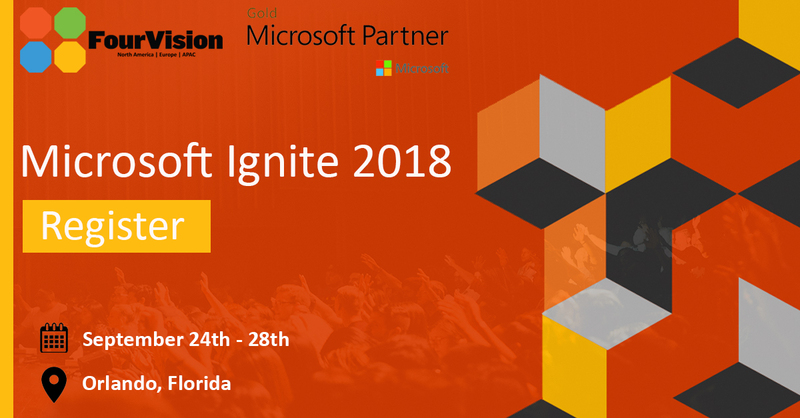 Microsoft Ignite this year offers the latest insights and skills from technology leaders that are shaping the future of cloud. Familiarize yourself with the latest tools and be enlightened by the latest updates and ideas directly from the experts. With over 700 deep-dive sessions planned and over 10 expert-led and self-paced workshops, you can certainly expect Microsoft to go all out this year. Gain new skills: The numerous demos and keynotes will have you learning about new tech in a way that speaks to you. Get exclusive access to all the latest developments and updates across Microsoft’s product and solutions. Meet the experts: What if you could connect with the experts who build and support the services and products you use every day? You also have the opportunity to network with your peers and exchange best practices all under one roof. Discover new tech: Witness hands-on demos, visit attendee hangouts and Microsoft Mechanics studio sessions to experience the latest tools and technology. Microsoft have put together a line-up of formidable talent which includes Satya Nadella, Julia White, Brad Anderson and James Philips. Transform your future with five days of immersive training, networking opportunities and product deep dives. Don’t miss out and register today.